Home / News / HEARTBREAKING​: LITTLE GIRL DIES DUE TO PLAITED HAIR! 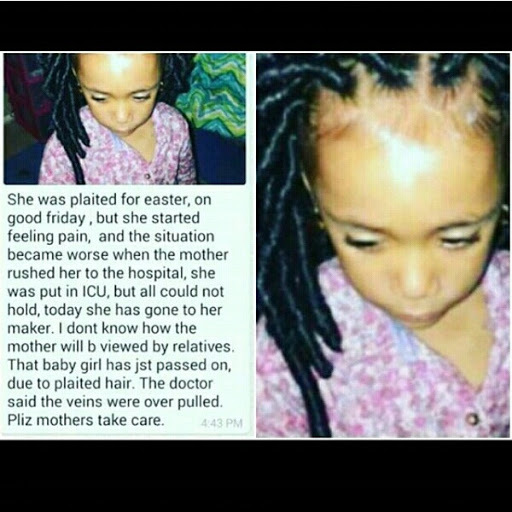 HEARTBREAKING​: LITTLE GIRL DIES DUE TO PLAITED HAIR! This is so sad. From Easter season merriment to sorrow. Who would have imagined​ that an ordinary plaiting of hair would result to the death of the little girl. Mothers please take note, be mindful of how tight your daughter's plaited hair is, be mindful of the kind of hairstyles you permit.